Any form of tourism ground transportation is regulated by the Ministerio de Obras Publicas y Transporte (MOPT) in the Executive Decree No. 36223- MOPT-TUR, Regulations and rules for the Operation of ground tourist transportation services; therefore, any private transportation company must be registered in the Ministry. To register, a company must meet a series of demands to the current regulation; all vehicles undergo a technical review every six months, and each vehicle must carry the right of movement (Marchamo) and the up to date insurances by law. It shall also bear a list indicating at the time of the transfer the name of all passengers on board. 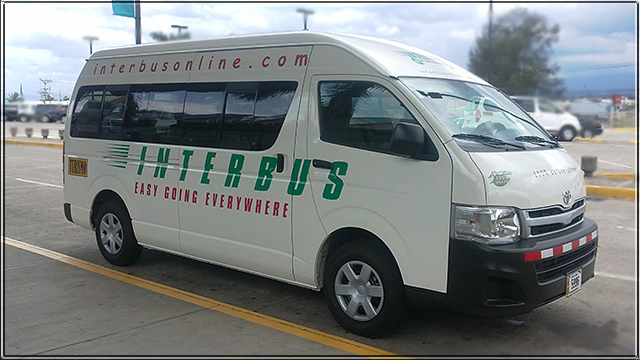 Interbus meets all requirements established by the MOPT and related issues such as capacity, safety, overall units; payment of duties and taxes and the respective permits. The drivers are registered with the MOPT as specialized for driving in public transportation. So we are authorized to offer our services. "We always recommend checking before hiring a company; remember that your safety is more important." Because your safety is very important. INTERBUS has different policies for your security; the liability civil policy, and the Umbrella policy, in the National Insurance Institute (INS) of Costa Rica.